T-moblie cell phones absolutely rock. There are a ton of cell phone manufacturers producing mobile phones for T-moblie, including the Samsung t629, the Nokia 2610, and the Motorola V195s. If you check out the T-moblie site, you'll find t-moblie cell phones starting as low as $0.00 (when they're included as part of a phone plan) and going as high as $249 for the t-moblie Blackberry Curve and $299.99 for the t-moblie T-mobile Wing. October 02, 2007 Permalink Comments (2) Digg It! Del.icio.us It! After two years of hype and multiple launch delays, iRadio has been shelved temporarily for re-work. Apparently, the beta test didn't do too well. US wireless network providers weren't too keen on iRadio's "sideloading" technology, which required users to dock cell phones to their PCs to refresh the music (much like iPods). They preferred taht the music be delivered across their networks in the form of a streaming music service. It's a major change that will take some time. With VCast, Amp'd, XM, Sirius, Orb, the iPhone, and many other integrated mobile devices already in market or launching soon, it's going to be quite a challenge. March 02, 2007 Permalink Comments (0) Digg It! Del.icio.us It! Wow. Today is the day to be at MacWorld. Just check out Engadget's minute-by-minute breakdown of the iPhone introduction. Honestly, it's a little too cool... Be sure to check out what other iPhone extras are rounding the corner. January 09, 2007 Permalink Comments (0) Digg It! Del.icio.us It! For a second, I thought I was experiencing Deja Vu -- but nope. Motorola iRadio was named the Best Radio Service at the 2006 Billboard Digital Entertainment, Media + Marketing Excellence Awards (DEMMX) ceremony. iRadio beat out SIRIUS Satellite Radio and Yahoo!® Music. December 01, 2006 Permalink Comments (0) Digg It! Del.icio.us It! There's no mention of iRadio, but lots of other bluetooth toys are talked about in this PowerPage podcast interview with Paul Alfieri, including Ojo Personal Video Phone, the Homesight monitoring, security and control system, DCT6412 dual tuner, High Definition DVR and Motorola and Oakley's RAZRwire Bluetooth sunglasses. November 26, 2006 Permalink Comments (0) Digg It! Del.icio.us It! LaSean Smith and Dave Ulmer will be representing Motorola iRadio at the Digital Music Conference in Miami, FL next week. Luis Samra, CEO, Wilean, Inc.
Peter Sung, Managing Director, FM, Inc.
Geez, those panels are ginormous; at 90 minutes per, that gives every speaker roughly 6 minutes to brag about their company. Go get 'em, guys! November 08, 2006 Permalink Comments (0) Digg It! Del.icio.us It! Grid7 VentureCast, a podcast focusing on entrepreneurs living in Arizona, interviewed Sr. iRadio Product Manager LaSean Smith about his past exploits at Africa.com, business school, the music industry, and elsewhere. 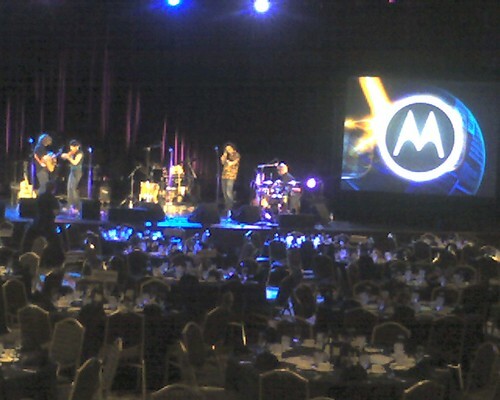 Check it out if you're interested in learning more about the Motorola iRadio team. October 17, 2006 Permalink Comments (0) Digg It! Del.icio.us It! Pricing: The price is currently estimated to be around $7-10, up from earlier estimations of $5-7 a year ago. Installing iRadio: Users will download iRadio software to a PC with Windows XP. Can manage separate playlists from music repositories. How it Works: Phones will synchronize with music collections via a USB connection, and can then transmit the music via Bluetooth to other Bluetooth-enabled stereosystems. Station Count: More than 800 commercial-free radio stations are now available through Motorola iRadio. Which Phones? Currently, iRadio is only on three phone models, though more are coming. Next Album Leak of the Week: The weekly album leak started with Monica last week, and will continue with Rod Stewart's album next week. Launch Date: Last but not least, what about the launch date? Motorola iRadio is currently being tested in several US cities, but could officially roll out early next year, according to Dave Ulmer. October 10, 2006 Permalink Comments (0) Digg It! Del.icio.us It! Motorola announced today that music programming from NPR, American Public Media, and Public Radio International (PRI) will be made available on iRadio. Included in the programming are NPR shows Story of the Day, NPR Shuffle, and All Songs Considered; American Public Media's Marketplace, The Splendid Table and The Writer's Almanac with Garrison Keillor; and PRI's The World, Studio 360 with Kurt Andersen, and Open Source. Motorola iRadio shares the public radio system's mission to offer Americans high quality audio content that is meaningful and relevant to their lives. We are pleased to build on listeners' enjoyment of their local public radio stations by bringing this strong slate of content to their mobile phones. Motorola iRadio has really amassed quite a repository of content over the last year, including music from five major record labels, several indie labels, and news and talk shows from The Associated Press, AccuWeather, and Taldia local news and national paper programs. I'm impressed. I'm also very pleased -- my wife and I love NPR, especially All Songs Considered and All Things Considered. Way to go, Moto. October 09, 2006 Permalink Comments (0) Digg It! Del.icio.us It! The future of radio was discussed by a panel of digital radio luminaries within the industry at the Digital Music Forum, including Dave Ulmer of Motorola, recently. Digital Media Wire has a nice summary of the discussions here, in case you're interested. October 05, 2006 Permalink Comments (0) Digg It! Del.icio.us It! Our consumer and carrier trials have been expanding gradually and are no longer limited to just 4 US cities - they stretch nationwide and globally across geographies and demographics as our trials continue to grow. So, for now, our consumer and carrier participants will be in for a treat each week as a new pre-release album is leaked. ... We're continually adding trial participants as we head to a broader launch - within the US and other geographic regions. October 03, 2006 Permalink Comments (0) Digg It! Del.icio.us It! Motorola kicked off a "Leak of the Week" program (that's my name, not theirs) by making several songs from J/Arista Records artist Monica's upcoming album available for listening through iRadio. Listeners will be able to play "Everytime Tha I Beat Drop" on an iRadio-enabled mobile phone, along with several other songs, from the album Making of Me, through the SonyBMG iRadio music channel. Album leaks can be a great way to generate buzz about an artist or a new music service. In this case, the music is only being released a day ahead of the album release date (which is tomorrow). By the time most people will find out about it, the album will already be in stores, and the effect is somewhat anti-climatic. Still, there is PR and buzz to be gained all around, and it's a good move. And for listeners, it's an easy way to check out a new album before shelling out the change. October 02, 2006 Permalink Comments (0) Digg It! Del.icio.us It! "Clear Channel is already providing white label programming for Motorola's iRadio service, but that is more of a time-shifted radio model rather than a live..."
...The company's content can be heard on AM/FM stations, HD digital radio channels, on the Internet, via iPods, through Motorola's iRadio cell-phone service, and via mobile-navigation devices from Cobra, Garmin, Kenwood and others. September 23, 2006 Permalink Comments (0) Digg It! Del.icio.us It! In case you're interested, there's a great, in-depth review of the Motorola ROKR E2 phone at OSNews, including video, clips, screenshots, etc. August 31, 2006 Permalink Comments (0) Digg It! Del.icio.us It! Motorola finally launched the ROKR E2 yesterday...but only in Singapore. No news on the US release. A 1.3 megapixel camera, FM radio, 3.5mm port for headphones, and other goodies...all for $458 (with operator contract). CNET gives it mixed reviews here. As expected, it's NOT using iTunes, but instead, a proprietary player...possibly iRadio? August 30, 2006 Permalink Comments (0) Digg It! Del.icio.us It! "... Develops software framework, create new features and enhancements to the server in the domains of: secure music distribution, heterogeneous multimedia codecs, play-list synchronization, digital content metadata management, service discovery, transaction billing, data mining, authorization/authentication and wireless LAN interfaces. ..."
The job description has a very high "meaningless-acronym to words-I-understand" ratio. Beware non-techies. August 23, 2006 Permalink Comments (0) Digg It! Del.icio.us It! Motorola iRadio will be getting local, national, and international news spanning business, sports, entertainment, top news, technology, health, U.S. and International events, politics, science, and more, from Taldia's spectrum of content partners, including the Associated Press and US newspapers. Motorola iRadio® listeners can now customize their news radio experience by choosing from a wide selection of local, national and international news reports. Right, great. But what "iRadio listeners"? I guess they're referring to the small number of people trying iRadio out in one of the four test markets (Chicago, LA, Phoenix. and Washington DC). August 21, 2006 Permalink Comments (0) Digg It! Del.icio.us It! We know, we know, we never write, we never call. But we’ve been busy working on the service that can provide you with access to a nationwide audience of music and talk fans — Get Heard Network. In fact, our launch is just around the corner and it’s time for you to get ready to participate. Any musician, independent label or podcaster with something to play, sing or say. That is…as long as you own the rights to the programming. No taking credit for other people’s work allowed. When you join you will be creating your own radio station. Stations should be at least 3 hours in length and updated frequently, at least weekly, to keep your audience interested. You may want to get a jump on things by familiarizing yourself with audio encoding, RSS and XSPF. However, we know you want to focus on the music so details on how to publish your station will be provided soon, along with a list of companies that can help you get up and running without coughing up too much coin. Oh, sure, now we’ve got your attention. It’s true, as a member of Get Heard Network you get paid for your broadcast. We make payments directly to SoundExchange and publishing rights organizations such as ASCAP, BMI and SESAC, which in turn pay you. The current statutory rate is $.007 cents per play. That’s unlike traditional AM/FM radio which pays zilch to SoundExchange artists and labels. So make sure you’ve registered with SoundExchange and your preferred publishing rights organizations. HOW CAN I MAKE MY STATION UNIQUE? Spice up the listening experience for your fans by including interviews with the band, behind-the-scenes stories and exclusive tracks. But don’t just take our suggestions, you’re creative types, use your imagination and make great radio. Keep your eyes on your inbox for our next newsletter, loaded with info on technical allies, breaking iRadio news, and answers to common questions. August 16, 2006 Permalink Comments (0) Digg It! Del.icio.us It! Jimminy-kricket! Another taste of iRadio launch-like action on the part of Motorola. Motorola finally sent out its first-ever Get Heard Network newsletter to people (bands, label owners, talk show DJs, etc) who signed up to create iRadio "radio stations"...er, as far back as November of last year. But hey, at least it's out. DJs are recommended to be familiar with, "audio encoding, RSS and XSPF" and have at least three hours of programming prepared. Yikes. DJs will be paid $.007 cents per listen for their programs. Cool. Pretty cool. More info at iRadio Get Heard Network. Hot diggity! iRadio has in fact NOT fallen off of Motorola's product launch schedule. Peggy Salz over at MocoNews interviewed Dave Ulmer about iRadio mobile content in general, and Motorola's plans for the space. Recommendation Engine: Motorola's plan is to use an Amazon-like recommendation engine (suggestions based on what other listeners like) as opposed to a machine-engine (i.e. Pandora). Dave spoke a TON about the long tail of talk radio, making comparisons with the user-generated contetn communities such as YouTube, MySpace, and Facebook. Announcements: Motorola will be announcing relationships with several "3-letter" networks over the next 90 days. So, iRadio Waves has awoken from a deep slumber... Check out an expanded summary of the interview, or listen to the entire 25-minute clip at MocoNews here. August 14, 2006 Permalink Comments (0) Digg It! Del.icio.us It! New posts containing "iRadio" for the last 30 days.